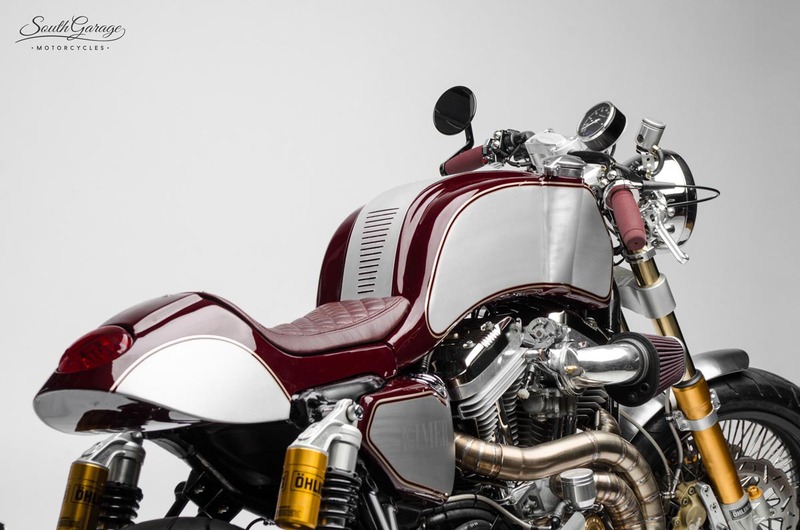 It's been some time since I featured a custom build from Italy's South Garage. That doesn't mean that Enzo and the boys have been sitting around twiddling their thumbs though. 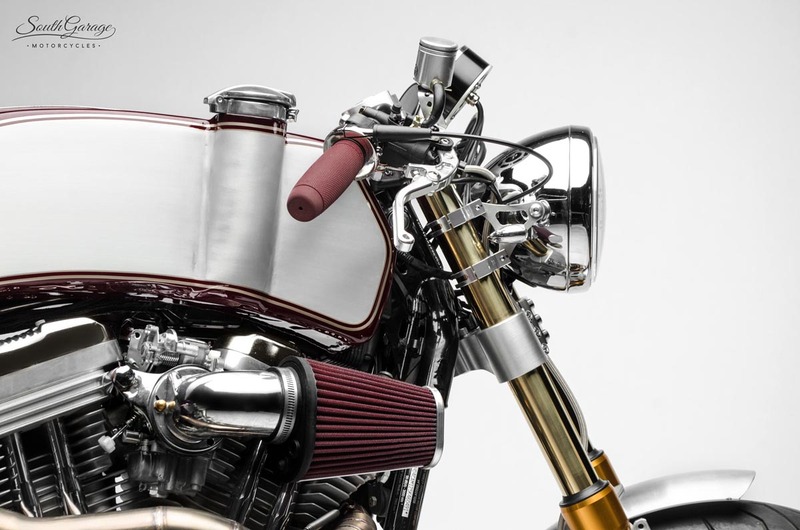 Their website currently showcases over 30 original South Garage custom builds that are enough to make any motorcycle lover weak in the knees. 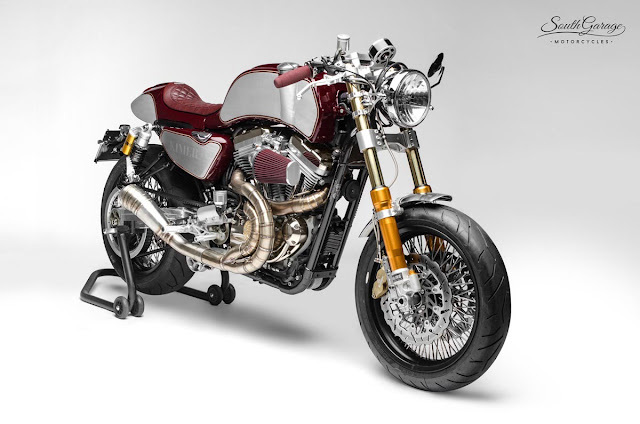 Although European and British made motorcycles tend to be their preferred subject matter, South Garage have ventured into relatively new waters with their latest Harley Davidson based build. 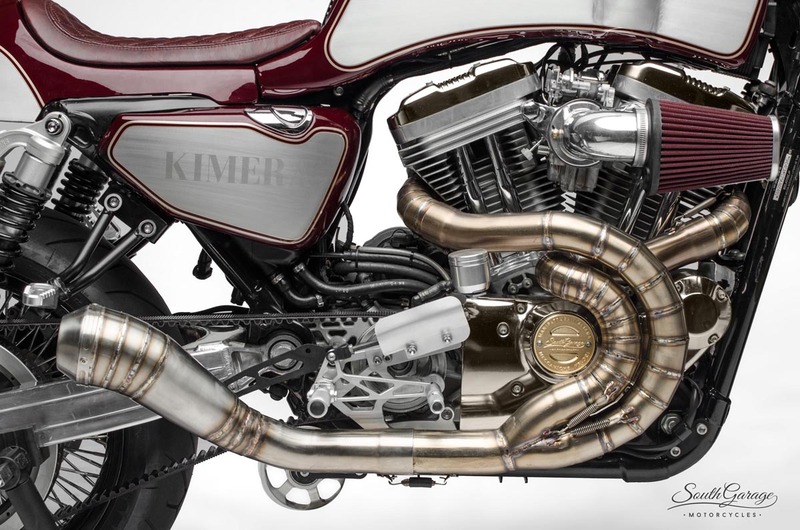 The South Garage 'Kimera' started out life as a 2006 Harley Davidson 1200cc Sportster. Never the one to turn down a challenge the South Garage team set their sights on converting the Harley cruiser into a cafe racer styled ride. This of course meant dealing with the inherent Harley Davidson design features that make this type of transformation a problematic one. Levelling out the Sportster's hunched frame and squat rear end was the most challenging task to overcome. For this an entirely new front and rear suspension system was chosen from the Öhlins catalogue. At the pointy end there's a set of custom mounted gold anodised forks, held in place by a one off CNC alloy top clamp and rolling on a downsized front rim. At the back a pair of tall piggy back shocks mounted to a lightweight, alloy swingarm lift up the rear to level out the backbone of the frame. 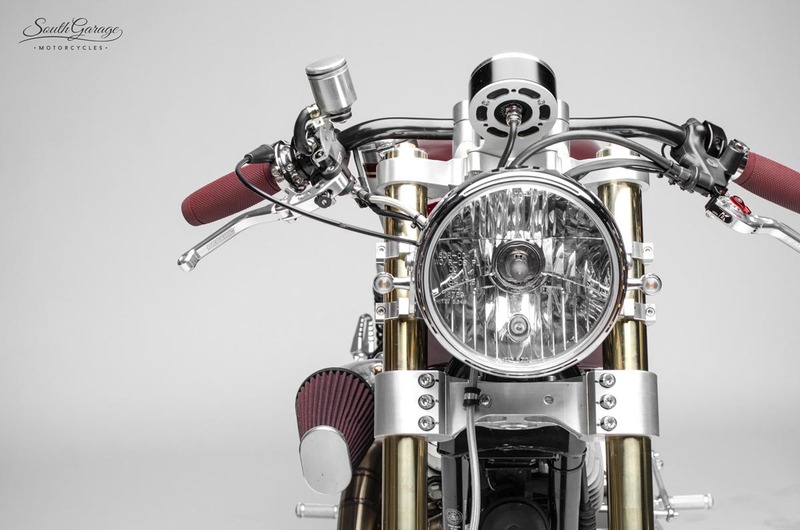 The bikes one of a kind tank and tail have been hand formed from aluminium. 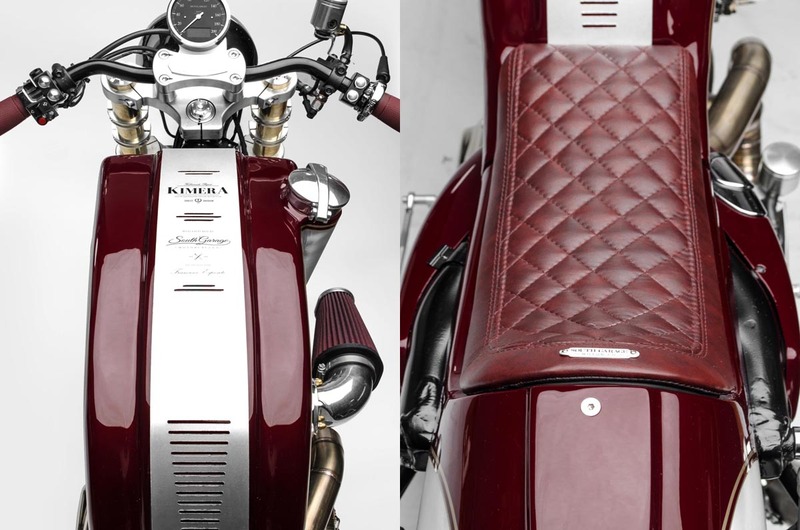 The custom, narrow fuel tank sits low on the frame and features an offset filler with Monza styled cap giving it a unique, asymmetrical aesthetic. The tanks belly has also been shaped to follow the curve of the engines v-twin heads to maximise capacity. 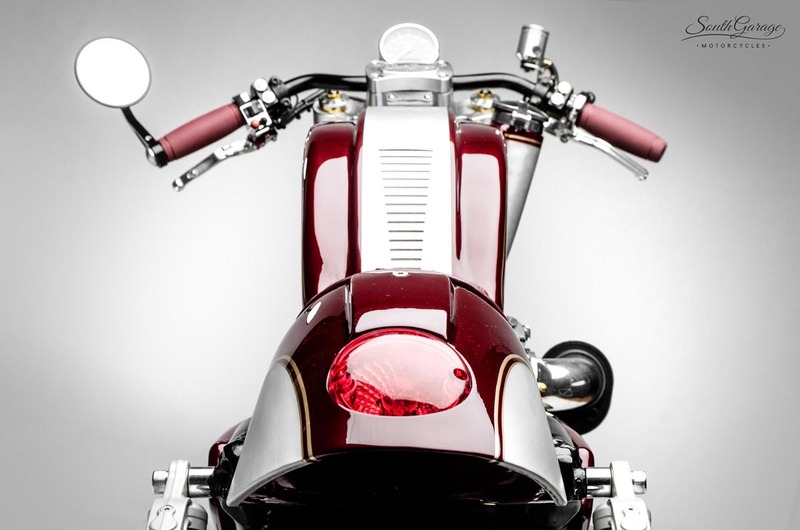 The tail uses a classic cafe style hump with an inset brake light and top ridge that mimics the lines of the tank. The bikes revised riding position utilises CNC machined rear set foot pegs and a custom made pair of low slung handlebars. The new bars create a similar appearance to clip ons without sacrificing rider comfort and have been finished off with custom levers and Biltwell grips. Instrumentation has been reduced to a single MotoGadget Chrono Classic Speedo and the small Sportster headlight was replaced by a Lucas 5" headlamp. 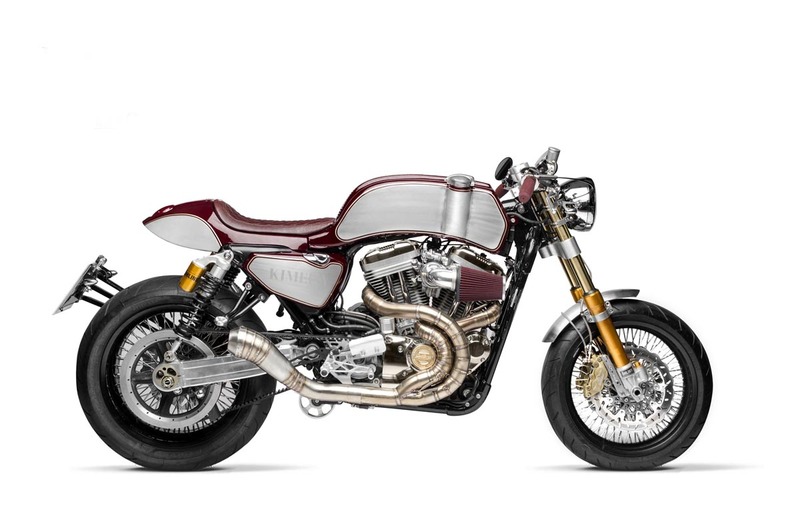 To further improve upon the Harley's handling there's a full Brembo brake package and not satisfied with the 1200cc v-twin's factory performance figures, South Garage have squeezed some additional grunt out the engine by adding a full titanium exhaust system, free flowing air filter and custom fuel map. One thing South Garage never fail to deliver on is a great looking paint scheme and Kimera is the perfect example. The combination they've selected uses a striking trio of brushed and clear coated alloy, Ox blood paint and gold pin striping that ties all of the other elements of the bike together beautifully. Harley's often cop a bit of flake in cafe racer circles and the comments these kind of builds get on my Return of the Cafe Racers social pages tend to follow suit. This time though I think Kimera could leave the neysayers lost for words.